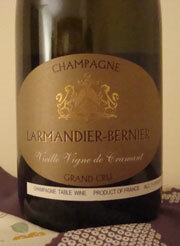 Larmandier-Bernier is a biodynamic producer with almost 15 hectares of vines averaging 33+ years of age. They are harvested manually and are 85% Chardonnay and 15% Pinot Noir, mostly Grand Crus in the Côte des Blancs This includes Grand Cru holdings in Avize, Cramant, Chouilly, and Oger and in the Premier Cru village of Vertus. These are brilliant wines but often need some time to show very well. The two tasting notes below, although I very much enjoyed drinking the wines, are of wines that really need at least a year or two more of age to fully express themselves. They use natural yeasts, which are present on the grapes when harvested. 99% of Champagnes have commercial yeasts added, sometimes because chemical spraying has decimated the natural yeasts, but often simply because it is easier and more predictable. At Larmandier-Bernier they believe that natural yeasts are an essential component of great wines, and that naturally occurring yeasts are an "essential" element of terroir. Everything is done as naturally as possible including using a minimum of dosage (added sugar). Although the Larmandiers have been making Champagne since the early 20th century and supplying such great and classic French restaurants as la Tour d'Argent and Taillevent, Champagne Larmandier-Bernier was established by Philippe Larmandier and Elisabeth Bernier in 1971, and they have been fully biodynamic since 1999. "The Larmandier-Bernier Champagnes are some of the purest and most utterly engaging wines being made in the region today. I can’t recommend them highly enough." Antonio Galloni, Robert Parker's Wine Advocate. Wine include the Tradition Extra Brut NV (80% Chardonnay and 20% Pinot Noir), Blanc de blancs Extra Brut NV (100% Côte des Blancs Chardonnays), Terre de Vertus Brut Zero NV (a rare single vineyard Champagne, all Chardonnay, from the midslope plots of Les Barillers and Les Faucherets of the vineyard Vertis), Rose de Saignee Extra Brut NV (100% Pinot Noir), and Vieille Vigne de Cramant Extra Brut (all Cramant vines and from 48 to over 70 years old, all Chardonnay). This was good but not great - it simply didn't show well and I'll need to retry this. Certainly it was very young when tried, and also the 2005 vintage isn't great, not as good as 2002 or 2004 for example. A very light yellow golden color, with a stream of miniscule bubbles. On the nose, immediate fresh baked bread upon opening, along with ripe golden apples. Slightly creamy and chalky, with a slight spiciness on the tail end. Easygoing on the palate. Crisp and clean. Some apples. Perhaps a touch of gingerbread. Chalk. Very nice but certainly no blockbuster. An easygoing drinker, at least today. I tried a bottle last summer that was cooked - days at 90 degrees plus, and although it was a shadow of its real self was still enjoyable and so I had been looking forward to trying another for months. Finally, I got my chance. On the nose, minerals and chalk. Very vinous. More like a red Burgundy than a Champagne, perhaps a Volnay with a bit of Morgon Beaujolais (think dark fruit). Strawberries and dark red fruits are in the palate as well but not forward; more in the background. 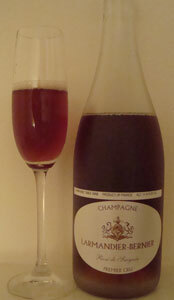 This is a very big yet smooth Rose Champagne.